I had originally planned to make this post a joint discussion of Cartagena and San Basilio de Palenque, but as I was writing, I realized I have too much to say about each of those places to cram them into one post. So I will write a separate one later about Palenque. This post is dedicated to the city of Cartagena, named “Cartagena de Indias” in 1533 by the Spanish conquistador Pedro de Heredia, whose indigenous lover India Catalina helped him curry favor with the Calamari people who lived there before he decimated and defeated them. Catalina turned out to be an important person in Cartagena’s early development, and there is a monument to her in the historic center of Cartagena. After all the mountain climbing and frenetic activity, it felt good to be ending our trip to Colombia in the beautiful Caribbean city of Cartagena. My hope had been that I’d get to see a lot of street music, dancing, and color, and those things, as well as an abundance of street vendors, were all over the place. Cartagena has a tropical climate, with temperatures hovering around 90 degrees all the time, so the A/C in our beautiful hotel was very much appreciated. We landed in Cartagena on November 6, during the week of celebrations leading up to November 11, Independence of Cartagena City day—which the people call Carnaval—commemorating the day in 1811 when Cartagena was the first city in Colombia to declare independence from Spain. And in true Colombian style, the loud and happy festivities were in full force when we arrived, with the “heat” turning up each succeeding day. We left on November 9, so we weren’t there for the actual Independence Day, but we were there long enough to experience the full flavor of the celebration, people dressed in colorful costumes, dancing and music in the Plaza Bolivar, Cartagena’s main square. As the days passed, people began lighting firecrackers in the streets and spraying white slime out of their car windows and from storefronts randomly as you walked along. “Just be sure to duck if you see it coming,” we were warned. “And don’t worry about the loud bangs. Harmless.” People were outside, it was loud and raucous, and everyone was having a great time. Landing in Cartagena, you see a skyline similar to that of Miami, but once inside the walled city, the colonial architecture stands out with its colorful pillars and tile roofs. Our guide Ismael was truly a fount of information and history, and it was fun trailing around with him for the three days we spent in Cartagena. In fact, in 1741, the British Navy—with Captain Lawrence Washington, George Washington’s older brother, in the force—attacked Cartagena with 27,000 soldiers. But after a 67-day battle, the Cartagenans, with a force of only 4,000, won on their native soil. Seems the British didn’t learn their lesson about patriots dedicated to protecting their native land! The Spanish also built a fortress, Castillo San Felipe de Barajas (in honor of King Philip IV), to accommodate eight batteries and a garrison of 20 soldiers and four gunners. It is made of a series of walls that form a pattern of bunkers, and has a complex maze of narrow, catacomb-like tunnels underneath. We spent most of our time in Cartagena in the walled city—la ciudad amurallada. This area, the Centro Historico, is a designated UNESCO World Heritage Site. But we did venture outside the wall to visit the barrio of Getsemaní, which was once a district where tourists didn’t go because of the crime and crumbling architecture. It has experienced a renaissance over the past decade or so, and is now considered one of the hippest barrios in Cartagena, with hotels and nightclubs and beautifully renovated buildings, as well as some more of the extraordinary graffiti we saw in every city we visited. Getsemaní has narrow streets and painstakingly refurbished colonial mansions, as colorful as the buildings in the walled city. The nightlife there is always vibrant, and particularly during Carnaval week, there was a great deal going on in Getsemaní. Our last day in Cartagena, we had an incredible “field trip” to San Basilio de Palenque, the first freed African slave town in the Western Hemisphere. My final blog post about Colombia will be about Palenque and its amazing history. Like the other places I visited in Colombia, Cartagena has left an indelible imprint on my heart and in my mind. As we said goodbye to Bogotá, the trip continued with a very short plane hop to Armenia, the capital of the Quindío Department, and one of the hubs of the Colombian coffee growing industry. After a short bus ride to the small town of Salento, the first modern settlement in Quindío, we experienced a much different lifestyle than we’d experienced in Bogotá. Because Salento became rather isolated when the route to Bogotá had been diverted from there, it retained more of its traditional colorful colonial architecture than most other towns in the efe cafetero (the Colombian coffee growing axis). The town is small, the streets dotted with multi-colored buildings as well as a friendly, relaxed lifestyle, and of course a large church rising over the main town square. Weather in Quindío seemed consistent—brilliant sunshine in the mornings and warm drizzle or rain off and on in the afternoons and evenings. Despite Salento’s small size, the tourist trade ensured that the many little restaurants and bars were rocking with some great music in the evening. We had some time to walk around on our own when we arrived, but the next day we were scheduled to be transported by Jeep over rutty, bumpy roads to a national park, where we would climb in the Central Andes, and then to visit a working coffee plantation. Parque Nacional Natural Los Nevados is located in the Cordillera Central of the Colombian Andes. Before we started our climb, we watched arrieros (muleteers) on horseback (Colombian cowboys!) driving their mules, laden down with all kinds of supplies, along the unpaved roads. When our local guide Anjelica said we would be climbing a rocky trail up to the summit at 2,400 meters (8,000 feet), Andrés raised his eyebrows and declared she was trying to kill us all. (I said a secret muchas gracias to the gym where I work out five times a week!) Some of the group decided not to attempt it. Others went part way and then returned to the bottom. The rest of us made it to “Mirador 2” before Andrés decided we should call it a day! We saw many wax palms, beautiful bromeliads growing out of the side of the mountain, and hundreds of beautiful birds, including a condor on the wing, on our way up the side of the mountain. And as the park surrounds a northern volcanic complex, we had a view of the Nevado del Ruiz volcano. It was an amazing and beautiful experience! After our descent from the heights, we climbed back onto the jeeps and traveled to a large coffee plantation, where we got to pick coffee beans (they were red!) and were shown the entire coffee making process. I’d had no idea that the ideal growing environment for coffee is higher than 4,000 feet. So much of Colombia is mountainous, it makes sense now that the country produces such wonderful coffee. 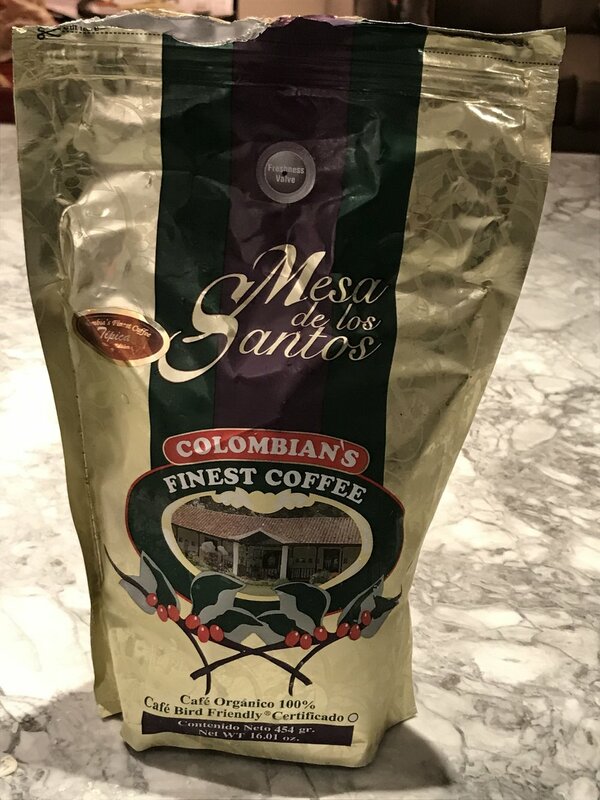 The experience was fascinating, and now every morning as I drink my Colombian coffee, I can’t help thinking about how much those little innocent beans have to go through before they sit in my coffee maker. Jardín was a feast for the senses no matter where you looked, and again, at night the locals and the tourists burst out of the many little bars and clubs around the main plaza, enjoying their food and drink and music. The next day we boarded our bus again and headed for Medellin. Because of a rock slide that closed the main road, our bus ride was much longer than had been planned, because we had to make our way through local towns and small roads, where the bus driver actually got lost! I had to laugh when I offered my iPhone’s Google Maps app to help him find his way. Our local guide Luis took advantage of the hours on the bus to tell us about the jaded recent history of Medellin and one of its most infamous past residents, Pablo Escobar. During the 1980s, Escobar virtually took over Medellin as the center of his cocaine enterprise, but he also used his vast wealth to build housing developments, schools, sports fields, and parks for poor residents, and provide social services for them, which enabled him to be recognized as a kind of Robin Hood type savior for the poor and bought him the support of many residents of Medellin. During Escobar’s reign as king of cocaine, Medellin also became the murder capital of Colombia. The city was rife with gun violence, and even the police were afraid to take any action, because street gangs and guerrilla and paramilitary groups fought for control of the city, taking thousands of innocent lives as they fought their turf wars. During the 1990s, paramilitaries patrolled the rooftops in the poorest neighborhoods, shooting people who refused to honor their imposed curfew or for whatever reason they wanted. In the early 1990s, Luis and his mother had fled to the United States, seeking asylum, after Luis’s father was murdered. Ending up in New York City with no English at all, Luis attended middle school and high school in the Bronx. But after he graduated, his mother was refused asylum status, and rather than take the chance of living undocumented in the U.S., they moved back to Medellin. Luis now has a son of his own and is incredibly proud of the renaissance his native city has experienced over the last twenty years. One of the most extraordinary developments in Medellin has been the construction of a Metro system that opened its first line in 1995. The Medellin Metro is an above-ground, rail-based system with two lines (the only such system in Colombia), as well as a cable car system that comprises four lines. We rode on both, and they are kept immaculately clean and efficiently run, a shining example of Medillin’s development and the pride of its people in the city’s new image. We took a tour of Comuna 13, an overpopulated, low income neighborhood that had been Medellin’s most notoriously violent neighborhood during the reign of Escobar, but has begun to climb out of the ashes of its past. In 2002, the Colombian military carried out Operation Orión, a strike intended to overthrow all rebel groups posted in Comuna 13. More than 1,000 police, soldiers, and helicopter crews attacked the area of 100,000 inhabitants, killing nine people (including three children) and injuring hundreds. The wounded couldn’t seek medical attention because of the siege, so they took to the streets waving white rags around until the fighting stopped. Post-2002, the residents voiced their anger at the violence through street art and community events. The incredibly affecting graffiti all over Comuna 13 gives a pictorial history of the terrible violence. Not only has the Metro enabled Comuna 13 residents to be connected to the rest of the city, but also the city spent $5 million to construct an elaborate outdoor escalator system, which enables residents to travel what used to be a 35-minute hike up the hill in six minutes. I felt there was a great deal of defensiveness among the people I met in Medellin, and also felt a little embarrassed to be walking around Comuna 13 staring at the still dilapidated houses and obviously poor people as if we were at the zoo. Nevertheless, there is a great deal of pride among the people who live there, despite the sadness at the lives lost and the terrible, decades-long violence that went on there. But there is much more to Medellin than just the terrible history of violence. Colombia’s most famous artist, Fernando Botero, was born in Medellin. He is well known for his depiction of voluptuous people and animals in painting and in sculpture. He donated twenty-three incredible sculptures to the city of Medellin, and they are displayed in the center of the city on the Plaza Botero, which also houses the Museo de Antioquia and is located quite close to a Metro station, Estación Parque Berrío, which makes it highly accessible. Also, we had one of our best meals in Colombia at Oci.Mde, Carrera 33 in Medellin. Although Oci.Mde. was a bit out of the way, our guide Andrés said that every time he was in Medellin he looked forward to eating at this amazing restaurant. If you ever visit Medellin, don’t miss this place! Not only was the food incredible, but I broke down and ordered the national drink of Colombia, Aguardiente, there. A very enjoyable experience!! The trip to Medellin was incredibly rich with history, art, music, smells, tastes, and experiences I will never forget. Our visit to Medellin over, we were ready to fly to our final destination, Cartagena, where not only was I looking forward to seeing that city, but also I was thrilled to have the experience of visiting San Basilio de Palenque, a town about an hour away from Cartagena and the oldest freed-slave town in the Western Hemisphere. Stay tuned for the third in the Colombia trilogy—Cartagena and Palenque. I recently had the very good fortune to take a trip to Colombia. I hesitate to call it the “trip of a lifetime,” both because I’ve been lucky to have other wonderful trips, and because I hope to go back to Colombia again, but I have to say this trip will stay alive in my memory forever as one of the best. So what, you say, does this have to do with dogs? Well, it’s easy to relate it. Two years ago, I hired a dog walking service when Moki was having some trouble acclimating to New York City. Andrés, the dog walker assigned to Moki, is a Colombian musician, born in Bogotá, living in New York. We found we had a lot to talk about—dogs, music, our former lives in Boston, and so on. So that is where this jumps off. When he realized I played the harp, Andrés introduced me to the Colombian llanera harp, introduced me to his friend Nico (who has since become my llanera harp teacher), and last but not least, really changed Moki in an incredibly positive way. So, I come to writing about this in my “Dog Blog,” Perhaps it’s a stretch to concatenate the two things, but in reality, Colombia is a “land of dogs.” Everywhere I went (and I was all over the country), I met dogs of all different shapes and sizes. And because the climate in Colombia is either temperate or semi-tropical, many of those dogs were living happily outdoors, either connected to a human owner or not, looking healthy and well fed. I arrived first in Bogotá, the capital and largest city in Colombia, having been invited by Andres’s parents, Fernando and Katty, whom I had met in New York, to spend a few days with them. For some reason, I’ve had Colombian friends for many years. I met my first Colombians in Boston when I lived there, and since moving to NYC, the number has increased. There is something about the culture, the music, the art, the ethos of the country that completely enchants me, and the people I’ve had the good fortune to become friends with are warm, inclusive, and incredibly charming, in a completely sincere way. When I arrived in Bogotá, everyone warned me about altitude sickness. 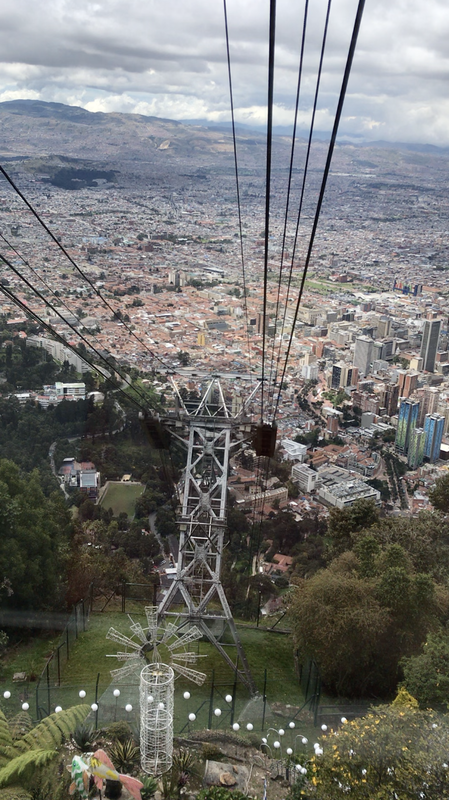 Bogotá is 2,640 meters (8,660 feet) above sea level. “No problemo!” said I, when my hosts took me to Guatavita, a town outside Bogotá settled by the Muisca indigenous people centuries ago. The Muisca mined the plentiful gold and threw it into Lake Guatavita to appease a god they felt lived under the water. When the Spanish invaded in 1545, their lust for gold impelled them to try to drain Lake Guatavita. They lowered the level of the lake and split the mountain in two, but were never able to retrieve all the gold at the bottom. To reach a vista where one can look down at the lake, it’s necessary to climb more than 250 narrow steps, up and around the side of the mountain. About 50 steps into it, I discovered that I did indeed feel the effects of the altitude. My hosts chugged up the mountain like nobody’s business, but they were very accommodating of my breathlessness and encouraged me to stop whenever I needed to. At the top, I was thrilled I did it, because the view is incredible. The lagoon where the Spaniards tried to find their “El Dorado” is an amazing sight, and, well, I was proud of myself that I’d had to fortitude to complete the climb. When I said “adios” to Fernando and Katty, I knew I would never forget their extraordinary kindness and willingness to show me “their” Bogotá. I feel as if I now have friends for life in a far-away city, which makes the experience even more amazing and Bogotá extremely special to me. Then I joined the tour I’d signed up for and set out on the rest of the journey. We stayed in a hotel in La Candelaria, which is a historic neighborhood in downtown, noted for its colorful Spanish colonial architecture as well as its funky shops, and universities, libraries, art centers, and museums. Along the cobbled streets, there is some of the most intricate and interesting graffiti I’ve ever seen. There are many animals depicted in the graffiti. The Muisca considered frogs to be a symbol of fertility, water, and renewal. Next, we traveled outside of Bogotá to the little town of Zipaquirá to explore the Salt Cathedral, a Catholic Church built in the tunnels of a salt mine 220 yards underground. Colombia is a strongly Catholic country, and even the smallest towns seem to have beautiful churches. But El Catedral de Sal is one of the most notable. It depicts the Stations of the Cross, each with its cross carved out of or into the salt to depict what Christ was going through at that point in his final journey. It ends in a sanctuary where masses are held for the public. The engineering involved in building this is unbelievable, and it requires constant maintenance and upkeep. Our final destination in Bogotá was Monserrate, the mountain that rises over the city center of Bogotá. At 10,300 feet above sea level, the mountain was considered sacred by the Muisca who lived there in the pre-Columbian era. After the Spanish conquest, the indigenous people’s temples were replaced by Catholic Churches. The large church at the top of Monserrate has an area where pilgrims have left their crutches and walking sticks after seeking healing. We were told that each pilgrim was asked to carry a brick up the mountain, and those bricks were used to build the church. Luckily, no one asked us to climb to the top of Monserrate! We took the funicular up the mountain, which allowed stunning views from all sides. 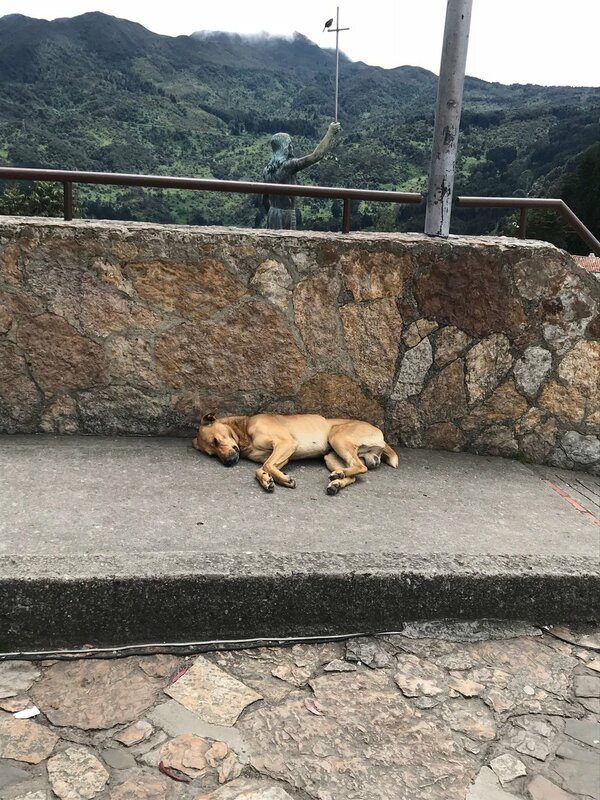 Dog relaxing at the top of Monserrate Hill. At the top of the hill outside the church, a very contented dog was sunning himself. He looked extremely relaxed in the warm mid-day weather. We all wondered whether he’d climbed up the mountain on his own, or had taken the lazy-dog’s funicular, as we had. Standing at the top of Monserrate and looking across the way, there is another hill, Guadalupe Hill, 10,800 feet above sea level, which also houses a church and a shrine to Our Lady of Guadalupe. Guadalupe Hill was also an important sacred site for the Muisca. Prominent there is a 49-foot tall statue of Our Lady of Guadalupe, built in 1945 by the sculptor Gustavo Arcila Uribe, which opens its arms to the city below. Although I was certainly excited to be en route to seeing the rest of Colombia, I admit I was sad to leave Bogotá. I’m not sure whether it is the fact that I have friends there, or whether it was the diversity, friendliness, and warmth of the city that so grabbed me. I just know that as I sat on the plane, ready for the short flight to Armenia, in the Quindío Department in the heart of the coffee growing area, I felt very sad. 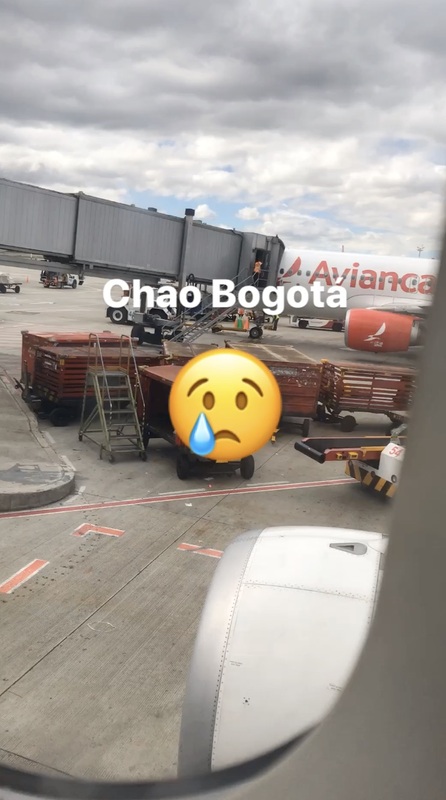 I know that I will return to Bogotá. The city affected me deeply. It will remain in my heart. The next installment of this blog will be about my trip to the pueblo of Salento, and then the travel to the Antioquia Department, where I visited the beautiful pueblo of Jardin, and the city of Medellin, which has had an extraordinary renaissance over the past decades. Do you ever miss your dog? I was away from home this weekend. I was invited to sing a paid gig in Great Barrington, MA, and it was too delicious to turn down -- Bach, Purcell, and only three rehearsals plus the dress rehearsal. There were only twelve of us singing -- three on each part -- plus a string quartet. Mostly very talented pros who wouldn't have taken the gig without a paycheck, so it was really fun to sing with such a great group -- e.g., no one had to threaten the basses with bodily harm for not learning the music. The music, J.S. 's Wachet Auf (Cantata 140) and the last movement of Herz und Mund und Tat und Leben ("Jesu Joy of Man's desiring"), meant that there was nothing arcane -- we'd all sung them before, so the learning curve wasn't steep. The venue was beautiful. St. James Place used to be an Episcopal church, built in 1857. In 2008, the rear wall collapsed and the building was condemned, but the parishioners decided not to pursue rehabilitation. In 2010, Fred and Sally Harris, a local couple who were members of the congregation, set up a nonprofit to redevelop the site. Sally Harris calls it a "secular conversion." They decided it would make a great performance space. They wanted to retain as much as possible and improve the rest. A new stage was installed, but the original flooring and pews were kept but resurfaced, with the pews extended 2.5 inches to make them more comfortable. Seating was raised, with sight lines changed so even the last row could see the stage. The center aisle leading to the stage was taken out, refurbished, and replaced. It would take a blog longer than this to describe all the other renovations and improvements. All the beautiful stained glass windows were retained. The acoustics are magnificent. 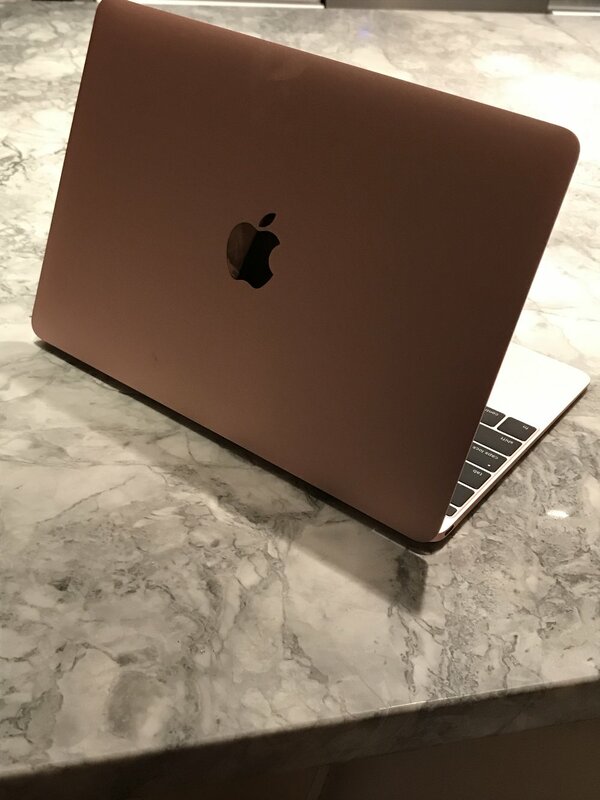 It only opened the beginning of 2017, so it's shiny new and gorgeous. So, here I was, lucky to be singing this lovely music with a bunch of great musicians in a wonderful space, and what did I keep thinking about? Hint -- not the music. I kept missing my dog. I knew he was being well taken care of. Because Moki has "special needs" now, when I am going to be away, I bring him to his original dog-sitter, Lauren, who lives in West Nyack, Rockland County, about an hour north of the city. It's out of the way, but she was a vet tech, and she knows how to give him his meds, and he loves her (although the brat pretends not to when I drop him off), and when he's at her place (her house, not a kennel), he gets to play with her kids and her dog and whatever other dogs are boarding there, and to run around outside on her half-acre property. I missed him and thought about him anyway, the entire time, even though I always complain about what a handful he is. Great Barrington holds a thousand memories for me. When I lived in Boston, we'd go there at least once or twice a year, strolling around the little downtown, eating the best Japanese food in Massachusetts at Bizen, enjoying the ambiance. But this time, the experience just wasn't great. I came to the conclusion that I am now, officially, a conceited, urban night creature. After the concert, at about 10:45, a few of us decided we really needed a cup of coffee. I know, I'm weird, it is what it is. Most of the town was closed up tighter than a drum. We found one little dive that had some nice live music, but when I asked the bouncer whether it was possible to get a cup of coffee in there, he stared at my purple hair, raised an eyebrow, looked me up and down, and then said, "Sorry, hon, we stop making coffee at 6:30. Anyway the kitchen closed at 9:30, so now we're just serving drinks." He was actually very nice, but I'm positive he thought the aliens had landed. He wished us well. "You girls have fun, now," he said, waving as we walked away. I think he was relieved. This morning, when I drove off to come home via Lauren's house, I noticed there were still a few really nice things about the "deep country." The smell of new-mown grass has always grabbed me. I'm a smell freak, and I love that smell. Gas was about ten cents a gallon cheaper there. The mountains are pretty. Alas, I can't think of anything else. Not only was I missing my dog, but I was really missing the crazy, noisy, urban sprawl of NYC and its different people -- nationalities, colors, accents. Our concert wasn't sold out, but it was almost sold out, and looking out into the sea of people, what was most apparent was a sea of homogenous white faces. The soprano soloist, from New York, was an African American woman, but I'm pretty sure she was the only one in that entire place, except for her mom and a couple of folks in the chorus. The town was deadly quiet at 10:30. It was very dark, few lights. We finally found a place open, but the coffee had been sitting in the pot so long you could cut it with a knife, and "at that hour," they didn't want to make a new pot, so I didn't partake. I lived. So I missed my dog, a lot, and I missed my city almost as much! Driving home this morning, until I got to the New York area, I could count the number of cars sharing the road with me on the fingers of one hand. I picked up Moki, who was fine, and we were both happy to see each other. I just wish I were better at compartmentalizing. I know this sounds sexist, but I do think most men are better at that than most women. I read an article from the LifeWay Press from Nashville, TN called, "Men are Like Waffles, Women are Like Spaghetti." I was feeling a little spaghetti-like the past couple of days. Sometimes I wish I could be more like a waffle! Brahms German Requiem -- gorgeous but time consuming to learn! I have been woefully neglecting my blog over the past few months, for a variety of reasons. Yes, concert time is approaching, which means rehearsals, rehearsals, rehearsals, and more rehearsals. And because it's hard for me to say no to musical opportunities, I tend to overbook myself. But that's another subject for another time. The principal reason I haven't been keeping up with the dog blog is because Moki has been very sick, and it took a great deal more of my physical and emotional time than I thought it would. Now, I can sort many of my friends into two categories when it comes to owning a dog: those who do, have done, and might do in the future; and those who don't and never will. The former, when I cry on their shoulder about Moki's illness, give me a hug and really do understand, whether in person or on social media. Those people provide really great moral support. The latter think I have lost my mind and gone completely bonkers. "You paid how much to the Animal Medical Center?" they say, their eyes wide with [horror, shock, disbelief, anger] (choose 1). "For a dog? You realize that would have supported a third-world country for a month?" Back in the day (way back in the day), dogs were chained up outside and schlepped to the vet once a year for a rabies shot. When they got sick, frequently their owners put them down. This feels harsh even to write, and I realize I am generalizing, but I think that was a much more "a way of life" than it is now. If you're reading this, you likely know me. Likely you understand that my dogs are my family, and when I take one on, I take it on for "better or for worse." And for life. Moki came to live with me when he was 8 weeks old. He was always hardy, healthy, feisty, "wicked smaht" (as we say in Boston), funny, and lots of fun to snuggle up with. He's a hugger and a leaner. He's not allowed on the furniture, except for the bed--his bed, which he allows me to sleep in too, if he's in a good mood. So back at the end of last year when I noticed he was losing a lot of weight and turning his nose up at his food, I got really worried. You New York City natives know what I mean when I say, Moki was always a dedicated fresser. (If you're not from NY, it means he loved to eat more than just about anything else in the world.) But he would look at his food bowl sadly, sniff it, and walk away. And his vertebrae and his pelvic bones started becoming way too prominent. So, it was time to do something. After an ultrasound and an endoscopic biopsy, he was diagnosed with IBD (inflammatory bowel disease) and possible PLE (protein-losing enteropathy). His albumin levels were abnormally low, as were his folic acid levels. His lymph nodes were enlarged. The good news was, there was no sign of cancer. So, now the fun began. Many prescription medications (Prednisone, Mirtazapine, Cerenia, Prilosec, Metronidazole). And prescription dog food. So we waited and hoped he would begin to gain weight. Against veterinary advice, I consulted a prominent holistic vet on the West Coast, who did a saliva test on him, which showed that he was indeed reactive to many many foods, including but not limited to chicken, turkey, white fish, cow dairy products, corn, wheat, peas, lentils, and many more. I then consulted a prominent doggie nutritionist in Florida, who used the list of no-no foods to personalize a diet for Moki. I combined the new diet with some of the prescription diet, and began the process of cooking for my dog. Then, voila! Slowly, he began to eat and to enjoy his food again. But for weeks, the scale inched up only slightly. This is not Moki! He didn't morph into a Golden Retriever! Only within the last two weeks or so, when I took him to the AMC for a weigh-in, had he gained a significant amount of weight--seven pounds of the twelve he'd originally lost. I danced a jig! My vet danced a jig! And I'm going to confess that I sent the doggie nutritionist an email asking her how to adapt the diet so that he wouldn't gain too much weight! She laughed and said, "Cut back on it. That's all you have to do." Doh! The bottom line is, Moki will live with this condition for the rest of his life. And there's no guarantee he won't develop sensitivities to some of the foods he can eat now, so it will be vigilance and no more taking for granted that I can open a random bag of dog food and give it to him. The other good news, though, is that making Moki's food has become less of a pain and more of a normal process. I figured out a system, so I'm not spending all my time doing it. And somehow, during the time he was sick, I was able to finish the edits of galleys and such for the new book, Time Out (see cover photo below), finish another novel, called The Journey (my eleventh! ), and get cracking on yet another one, The Rise and Fall of Arensky. So watch this space. My pledge is not to neglect it for such a long time in the future. But truth be known, if my dog gets sick again, I will take care of him just as well as I did this time. He gives back a great deal more than I even give him. I spent yesterday afternoon at Pier 94 in NYC helping out for the second year in a row at the Belgian Tervuren booth for the Westminster Kennel Club's "Meet the Breeds." It's always fun to do that, because I get to play with dogs for a day and talk to many people about Moki's breed. The booth was decorated with festive lights and huge tapestries of Tervs herding, doing agility, and many of the other activities they so love to do. This year, the place was overrun with people, perhaps because it was a little warmer outside than it was last year, or because New York was getting over a one-day snowstorm and people had some cabin fever. After a few hours, I took a little break and walked around the place a bit, but because I didn't want to leave the folks at the booth high and dry, I decided to make a circle only around the booths in the general vicinity of ours so that I could get back quickly. The AKC currently recognizes 189 breeds of dogs, and I suspect that most of those breeds were represented there yesterday, but in my little walk-about, I had a chance to see only 20 or 30 of those. And even in that fraction of the total number, something interesting and ironic jumped out at me. First, I passed the Bedlington Terriers. An old breed, the first Bedlingtons were bred as far back as 1782 to hunt vermin in the coal mines in Northumberland, in northeast England. Rumor has it that "back in the day," they were dyed to improve the look of their coat. People often comment that they most resemble sheep! Next, I saw a beautiful Doberman Pinscher, sleek, black, and a K9 dog, so well trained that he stood stock-still without a leash, obeying his owner's commands, despite all the noise and commotion around the booth. Dobies originated in Thueringen, German, around 1890. The next breed that caught my eye was the Sicilian Cirneco dell'Etna, a sight hound that looked to me like a smaller Ibizan Hound or Pharaoh Hound. The owner told me these breeds are closely related. The breed cognoscenti call them CdECAs. They were originally used to hunt rabbits, and they can go for hours without food or water. This one was completely unfazed by all the noise and commotion--a long day! The next dog I saw was the Bouvier des Flandres. I'm partial to these guys, because they are originally from Belgium, like my Moki's breed. Bouviers are also herding dogs, originally used as farm dogs to herd cattle and sheep and to pull carts. The breed wasn't well defined until the First World War, when a Bouvier named Nic was trained as a trench dog and became the precursor to modern Bouviers. The folks at the booth were dressed in traditional Belgian costumes. Continuing on the circuit, I came to the Chinese Shar-Pei. Shar-Peis originated in China as long as 2,000 years ago. They're recognizable for the deep skin wrinkles that go from their heads to their toes. Originally used as a hunting dog, the Shar-Pei has a short, prickly coat. When grabbed on one of its wrinkles, the Shar-Pei could twist out of its enemy's mouth and get away from the bite. Changing gears, I passed the Borzoi booth. Borzoi is an archaic Russian adjective for "fast." Until 1936, the breed was known as Russian Wolfhound. Regal and sleek, Borzois were brought to Russia from Byzantium in the 9th or 10th centuries to be developed as wolf hunters. I couldn't leave out the Bernese Mountain Dog, a giant breed that is one of the Swiss Sennenhund dogs, all of which have the same color coats, a combination of black, white, and rust. (The other Sennenhunds, from largest to smallest, are Greater Swiss mountain dog, very similar to the Bernese but with short hair; Appenzeller, a medium sized dog descended from an ancient cattle dog breed; and Entlebucher mountain dog, the smallest of the four.) The breed was established in 1907. Berners were used originally as farm dogs, draft animals, and herders. They still participate in herding trials in the U.S.
Then I passed the Burgomasco Shepherd, also known in its Italian homeland as Cane da Pastore Bergomasco, one of the latest herding breeds recognized by the AKC. This breed migrated from Anatolia to the Italian Alps near Bergamo, Italy. An ancient breed, they were used by shepherds both to herd their sheep and to guard their flocks. The Burgomasco's coat is its most outstanding characteristic, combining three types of hair that combine to form dense, felt-like mats that protect the dog from cold and wet conditions as well as from the bites of wolves and other wild animals. Heading back toward the Tervuren booth, I passed the Malamutes. Malamutes originated in Siberia but migrated to the Americas 12,000 years ago. With similar genetic markers to the Siberian and Alaskan Husky, Malamutes are often mistaken for Huskies, which are actually quite a bit smaller. Malamutes are thought to have been created by the Malemiut Inupiaq (Thule) people for the purpose of pulling sleds and hauling freight. Malamutes are wonderful family dogs and are known as gentle giants. Next, I passed a booth where the Mexican Xoloitzcuintli (affectionately nicknamed Xolo) were being showcased. Xolos are hairless and come in three sizes: standard, miniature, and toy. Genetic testing determined that Xolos were developed more than 3,500 years ago by the Colima, Mayan, Toltec, Zapotec, and Aztec Native American peoples, who considered them sacred and believed that Xolos would safeguard their homes from evil spirits as well as intruders. After Columbus "discovered" the New World in 1492, he reported about the "strange hairless dogs" and exported some of them back to Europe. Then I returned to my own booth, where the Belgian Tervuren were showing off their beautiful coats. Tervs come originally from a small town in Belgian called Tervuren, but except for coat color and appearance, they are exactly the same dog as Belgian Malinois (short-haired), Belgian Groenendael (completely black), and Belgian Laekenois (curly-coated), all of whom show in the same ring in the European countries. There were too many others to mention here. But what occurred to me as I walked back to my booth was that these dog breeds originated all over the world, but we accept all of them into our lives and our hearts without question. I've been a bit of a one-trick-pony lately on the subject of immigrants in this country. But it's interesting how humans of all origins own dogs from all over the world. Certainly, these dogs become "American," as do the people who emigrate to this country, if not at first, then over several generations. Am I reaching with the analogy? Perhaps. But it still struck me that when it comes to dogs, we are much more accepting of differences than when it comes to people. If we could embrace differences in people the way we do in dog breeds, the world would be a much more compassionate place. Moki has been pretty sick for over a month--no appetite, rejecting his food, and losing a lot of weight. I took him to a local vet, but although the guy did some of the right things, it was a bad fit. He just didn't like Moki, and Moki and I didn't like him. So then we went where we should have gone in the first place--the Animal Medical Center--where Flash had such excellent care when he was diagnosed with osteosarcoma. Even better, one of my writing colleagues, Eileen Palma, is married to one of the internists at the AMC. So we had a connection. It worked from the get-go. Doug Palma, veterinarian extraordinaire, is smart, conscientious, and incredibly caring. From the moment Doug walked into the examining cubicle--photos of his wirehair Fox Terrier Oscar imprinted on the tops of his sneakers, LOL--Moki loved him. (Moki always--always--knows whom to love and whom not to love.) Doug got down on the floor with Moki, and Moki basically rolled over and let Doug examine him from top to toe. The conclusion was that Moki needed to have an endoscopic biopsy of his stomach and intestines, the worst possible outcome being some kind of cancer, which would have been a death sentence. The endoscopy was scheduled four days before Christmas. Merry Christmas. It would be cruel of me to make you wait until the end of this blog for the outcome of Moki's tests, so I'm not going to do that. The great news was that Moki has no signs of any neoplasm (cancer) in either his stomach or his small intestine. What he seems to have is some sort of food sensitivity or allergy that caused all the symptoms. Yes, I learned, this can even happen to an animal who has had no prior health issues and has been fed premium food all his life. So he's being treated with drugs that increase appetite (he's eating like a dog again, I'm happy to say! ), prescription-single-source protein food, and a wait-and-see attitude. Just watching him eat is extremely satisfying, because it was so hard watching him "not eat" for all that time. I'm cautiously optimistic that he will gain back the weight and be a healthy dog again. However, when we started the process, waiting for the results was excruciating, so here are some activities that helped me stay sane while I waited for the diagnosis. Hopefully they might help others in similar circumstances. Bake a lemon bread. My dear friend Cecily is a wonderful baker, and she is also very generous. So the first time I tasted her lemon bread, it was so delicious, I asked her to share the recipe, which she was happy to do. She told me she had bought one at a bake sale years before, and she loved it so much she asked for the recipe. So the lemon bread continues to be "paid forward." The last time I made it for some people, they all said I should post the recipe, and that's what I'm doing now. Bread: 1-1/2 sticks butter; 1-1/2 C. sugar; 3 eggs; 1/4 tsp. salt; 2-1/4 C. flour; 1-1/2 tsp. baking powder; 3/4 C. milk; 1 lemon rind, grated; 1-1/2 tsp. lemon juice. Topping: 1/2 C. sugar mixed with juice of one lemon. Preheat oven to 350 deg. Cream butter. Add sugar, eggs, salt. Sift and add flour and baking powder. Add milk, lemon rind, and lemon juice. Bake 1 hour or until done in greased loaf pan. Cool for 10 min. Remove from pan and brush with topping. Enjoy! Rake leaves. One of the reasons (really not the primary one!) I moved to the city was to avoid having to rake the ridiculous amount of leaf detritus that fell into my back yard every fall. I think my record was about 100 big bags of leaves from all the huge deciduous trees nearby. My back yard was fully fenced in, so even though the trees were off my property, after the leaves fell within the area of my fence, they had nowhere to go. But I wanted a city apartment with a back yard for Moki, which I got, and there's a really huge old dogwood tree in it. So guess what? Even though it's already January, that tree still has leaves on it, and when those leaves fall, they are in my back yard. Deja vu all over again! Knit gloves. I love to knit. Some years ago, I heard of a place that spun wool from dogs' undercoat. So I began to collect that opulent undercoat from my Tervs--Flash, Sizzle, and Ava--when they were shedding. I acquired a few skeins of Terv yarn, which is warmer than sheep's wool and beautiful to work with. The results are not only beautiful but true conversation pieces. And knitting takes time, which is a benefit when you're biting your nails down to the quick waiting for the medical reports to come in. See La La Land. Suspend any disbelief you ever had, and spend two hours with this incredible movie. Magnum opus. Play music. This one's a no-brainer. I'm so lucky to have my harp. It "calls" to me every time I walk by it, and if I didn't force myself not to sit down, I probably wouldn't do much else besides play. Then there are The Canby Singers and The NY Cecilia Chorus. Also, I've been looking for a vocal quartet since I moved here from Boston and had to stop singing with The Ad Hoc Singing Committee. Yup, schlocky barbershop, pop tunes, G&S, crazy arrangements of Rigoletto and Xmas Carols, whatever--I love it all. And I may finally have found a group. So music continues to be my true love and the sine qua non of my existence. Write books. I just sold two more to Black Opal, which makes it a total of 8 they're publishing. And I'm well into my next opus, book #11, which is a divergence from all of the others I've written. I will provide details later. But the fun news is that my third book is set for publication in March, only two months from now! It's called Time Out, and it takes place in current-day New York City as well as Boston in 1886! Stay tuned for more details as I get them. In the meantime, On the Rocks and Four Shots Neat are both available--from Amazon or from me. So if you haven't read them yet, I hope you will! Moki was born in the "deep country." His first home was in northern Connecticut, a couple of miles away from the UCONN campus, where his breeder lived on many acres of land and there was hardly any traffic on the quiet streets. He came home with me to Piermont, New York, which is not really rural (from the end of the Piermont pier that juts out onto the Hudson, you can see part of the NYC skyline), but a sleepy little village in the lower Hudson Valley, particularly in the nine non-summer months when tourists don't crowd onto its quaint streets and swarm all over the art galleries and The Turning Point, a little jazz venue in the town center. By the time Moki was about three, he'd developed a fiercely protective stance where I was concerned. He would lunge and bark at anyone who walked toward us with a dog on a leash, and his wolf-like look and loud bark was scary, especially to young kids. So, because my house had a fully fenced-in backyard for him, I tended not to take him on walks through the leafy walking paths that had been created out of a former railroad line. I spent mucho, mucho dinero on classes called "Grumpy Growler" and "Feisty Fido" with wonderful trainers like Sabine Hellge, who were fierce proponents of operant training methods. Every summer Sabine held classes outdoors in Westchester at a beautiful, grassy convent where six or seven of us with these "grumpy growlers" tried to instill in our dogs the fact that you can't really be a member of polite society if you lunge at humans and four-legged creatures on a regular basis. Nothing seemed to stick, so Moki was relegated to my backyard, where he enjoyed playing ball and running around but mostly by himself (unless the occasional skunk or hedgehog ambled into our yard under the fence). I developed such anxiety about his "antisocial" behavior, that I started to lose hope he could change. Then, in July, the country dog moved to the city (and Moki came too!). Suddenly we were in Manhattan, in an apartment, with sirens and car horns and bicycles and all kinds of noise we didn't hear much in Piermont. Moki was seven, so he'd lived for a long time in the 'burbs. In the city, people come in all different colors, speaking many different languages. And in the city, one doesn't have much choice--if you walk your dog, which you need to do from time to time, you encounter cars, dogs, people, baby carriages; and you listen to chatter and the noise trucks make when they back up and random screams and kids yelling--you know what I mean. I was loving it, but Moki was having a new experience that stressed him out. I've written about my wonderful dog walkers before--Paulo Rocha and Andrés Fonseca. Paulo's great contribution was that he told me what I'd surmised: Moki was a different dog when I wasn't at the other end of the leash. After that, Andrés did most of the "heavy lifting." 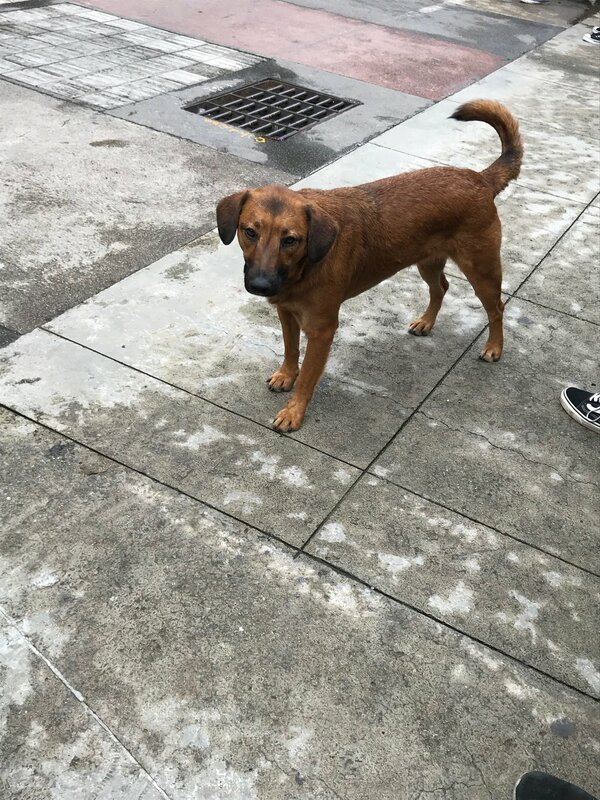 He read a bunch of dog training literature (way over and above what he signed up for), and soon he reported back that Moki really did great out there on the "mean" streets of the city--didn't react, didn't lunge, actually socialized with other dogs. So when Andrés went off for a few months to pursue his dreams, studying native music in his native Colombia, I got brave. I bit the bullet and took Moki out for a walk--not too long, just around the corner from my apartment and back. And to my amazement, Moki did great. He did his usual sniffing (of everything), but people of all sizes, ages, shapes, and colors passed by us, and he didn't even look up. And baby carriages approached from behind, and he was completely phlegmatic and let them go by without incident. And when he "did his business," he sat calmly as I bent over and picked it up, ignoring the passing dogs. After that first walk, my anxiety lessened. The walks got longer. Moki was really excited whenever I put on his harness and attached the leash. And he was happy to explore all the city places I wanted to explore. I found the Lycée Francais around the corner, John Jay Park a couple of blocks down from that, and a walking bridge that took us over the very noisy FDR Drive and onto a path along the East River, where boats and barges passed us in the water and many runners and bikers and dogs shared the path with us. Today, because he's been having some health issues, I walked Moki to the Animal Medical Center, which is about fourteen city blocks away. The AMC is to the animal world what Mass. General or NY Presbyterian Hospitals are to the human world--a huge teaching hospital with a waiting room that is teeming with animal patients, their humans, and doctors, nurses, vet techs, and every manner of employee you can imagine. I admit my anxiety crept back--my dog wasn't feeling well, and he was about to face bunches of other animals in the same boat. Because Moki's not a "normal" dog for the city (most of the dogs here are much much smaller than he) and is an unusual breed (Belgian Tervuren) that you don't see around much anywhere, people sometimes stop and want to pet him and tell me how beautiful he is. At the corner of 72nd and York, after my dog had pooped in the street and I was trying to pick it up without being run over, a nice looking guy approached us with a dog on a leash and said, "Is that a Belgian Shepherd"? I was quite surprised, because the vast majority of people have no idea what a Belgian Shepherd is. "Yes," I said. "Is that a PBGV?" (another breed that isn't very common). Now I had him, and he did a double take. "Yes!" he said, "Where do you live?" I pointed up the street. "I live down here," he said. "We need to get together!" In the meantime, my Belgian Tervuren and his PBGV (which stands for Petit Basset Griffon Vendéen) were playing (even though a PBGV is about half the size of a Terv) happily with no nasty noises at all. So the other cool thing about this great city is that people actually stop and talk to you, and your dog can even get you fixed up! LOL! In the 'burbs, although you might think it would be the opposite, people are often in their cars, looking grouchy and stressed out, and no one smiles, let alone talks to each other. So now, Moki and I both like the city much better. When I picked Moki up at the AMC at 5:00, after he'd been through a day of grueling medical tests, he came out with the vet tech and continued to be an angel. I walked him home in the dark, receiving a couple of comments from passers-by about how beautiful he is, and all was well. And at the end of that walk home, I decided that Moki could officially claim the title of "city dog." I mostly credit Andrés with this transformation (that's why they pay him the "big bucks," and if you believe that, I have a bridge I want to sell you in Brooklyn LOL). Moki still considers himself my great lord-and-protector, but now he is able to navigate the city streets with confidence and aplomb (and so am I). So, in our case, that's how you tell when your country dog has become a city dog. And at the age of 7-1/2, Moki has officially made that transformation. The other day as I was walking down a street in Chelsea after a long rehearsal, I bumped into an old friend, someone I haven't seen in thirty years or so. We both did a double-take, and I was tempted just to keep walking, but he put a hand on my arm and said, "Is that really you?" Busted, I thought. This was a guy I met at some music festival on Long Island when we were both in high school. I had a major, mind-numbing crush on him from the moment I met him, although our relationship never became more than a very good friendship. He played violin and I played cello, so we would get together frequently to play chamber music or to go to artsy movies and act as if we were intellectuals at age 16. (Too young to drive, we traveled back and forth to each other's town on the LIRR.) He was the valedictorian of his class and went to a major university, after which he went to a major medical school. He told me he's been practicing medicine in one of the toniest towns outside of Boston ever since--married a rich woman and settled into a very comfortable upscale suburban life. We agreed it was weird that I got my law degree and also lived in the Boston area for most of my adult life, but it took a random meeting in the middle of New York City for us to reconnect. We ducked into a little dive on 8th Avenue, where he sucked on a beer (he drank it out of the bottle, because the place looked like it had doubtful glass-washing credentials), and I sipped a cup of coffee that tasted like it had been sitting in the pot for about 14 hours. I confessed I had thought about fleeing when I saw him because the first thing my vanity threw into my mind was that I was a lot thinner in high school. He laughed and pointed to his head and said we were even because he used to have hair back then. Then he commented, one eyebrow raised, on my purple hair. "I still dance to the beat of my own drum," I replied, and he just shook his head and winked. "You were the star of all the plays and this really crazy girl," he said. "You were very cute, but I was a little afraid of you. Thought you wouldn't want to date someone like me." That was pretty shocking to me, but chicken that I am, I still didn't admit I really liked him--really liked him. He confessed he'd had some problems with alcohol, but he was pretty well in control now. I said it was funny how I never really drank very much, but I was the one who did crazy things sober--went out in the Atlantic Ocean with my boyfriend in a rowboat that had one oar, and the outboard motor got tangled in seaweed and died (don't ask about that one; I never even told my mother); smoked a cigar in the Metropolitan Opera House at intermission (back in the day you could smoke in public places) and lost another boyfriend over that--this friend reminded me he let me cry on his shoulder after that incident; and, well, the purple hair, to name a few. We talked about kids and spouses and music and life. I told him I was waiting for the publication of my third novel in March and still really involved in playing music. He said he wasn't--no time with a busy medical practice. Then he asked an interesting question--"What are the three most important things that energize you and define you? Don't think about it. Stream of consciousness." Without hesitation, I said, "My music, my writing, and my dog." He raised an eyebrow again. "So, you didn't mention your kids. Or your marriage. Or your career. I kind of thought you would have." I kind of thought I would have too. I pondered my response. Music? It's been with me my entire life. My tone-deaf mother told me I sang before I talked, which I don't doubt, and although I didn't make my career in music (much to my father's dismay--he was hoping I'd be the second coming of Pablo Casals), it is a thing I know I would not want to--could not--live without. And now I get to fulfill my lifelong dream of studying harp. Writing? Well, everyone who knows me knows fiction writing has been my second but most adored career, as it were. I delayed it for a lot of years while I worked in Corporate America, put food on the table for 6 kids and a disabled husband, and dreamed about writing the Great American Novel. After (how many?) rejections, the day I got that e-mail from my publisher saying, "We love it, we want to publish it!" was one of the happiest days of my life. And my dog? Well, yeah. I've always loved dogs and have had at least one my entire adult life. Moki is not without his "issues." He's a Belgian, for heaven's sake. Anyone who knows anything about Bergers Belges, this wacky breed, needs no explanation. But as much angst as he's dished up, he's given me even more joy. He's smart as a whip, loves me unconditionally, listens to all my crap, and holds no grudges. I told my old friend that I take my dog to a farm in New Jersey where I run around in a sheep field with a crook so that Moki can herd sheep and I can practice my Bopeep skills. He shook his head and said, "You haven't changed at all, have you?" "But I have," I said. "My hair is purple now." Since I moved to NYC in July, I frequently compare life here to life in the burbs. I guess this is natural for anyone, but I think it makes even more sense from a writer's perspective--I'm always listening, always comparing, always filing away impressions and observations for later possible use; you get the picture. Anyway, one of the most obvious differences is the heterogeneity of the city's population as compared to that of the burbs. I go out every day and meet and talk to people from many different countries--from Ethiopia, Brazil, Russia, Colombia, Sri Lanka, Bangladesh, India, Venezuela, Pakistan, Malta, Korea, Argentina, Japan, China, Albania...I could go on and on. And although most of them have accents, they all speak English. Although I loved studying languages and studied many languages for many years in public school and college and elsewhere (8 years of latin, 6 years of French, 2 years of Spanish taught by a man who was a native of Portugal, so he threw in some Portuguese as well, 2 years of conversational Spanish provided by my employer, Boston Children's Hospital, one year of Greek), the only language I speak fluently is English. When I've traveled to countries where the native language is one I've studied, I find that after a few days I begin to speak at least a little. But I'm so impressed that people not only travel thousands of miles away from home to come here to live, but also learn to communicate successfully in a language that is not their native one, while at the same time being able to switch back and forth at will. For some reason--I sometimes attribute it to the fact that I'm a musician, so I have a natural ear--I've always been able to hear the way a language sounds and am able to copy that when I speak it. The benefit is that I feel I'm doing justice to that language, and I'm happy I can. The downside is that sometimes people hear me and assume that because my accent is good, I am fluent in the language. That happened in Paris, it's happened in Spanish-speaking countries, and it sometimes happens here when I make a feeble attempt to speak to a native speaker of another language. Then I can't fake it anymore. I have to admit that no, I can communicate pleasantries with a good accent, but I'm not able to converse. All of this became quite clear when I brought Moki to the city. I knew I needed to hire a dog walker for him. The first one, Paulo, is originally from Brazil. His native language is Portuguese. Then Andrés came along, and he's Colombian, so Moki started hearing Spanish. I encouraged these folks to speak to my dog in whatever their native language is. Now that Andrés is away for a while, Katarina is the dog walker, and she's from Russia. So she promised she would speak to Moki in Russian. The super in my building is from Malta. The guys who installed my kitchen counters are from Albania. A friend in my chorus who was born in Kyoto loves dogs (and loves my dog), so she talks to him in Japanese. And the really interesting thing about it is that Moki responds to all of them. I just read some research that claims dogs really do understand words, despite the old rule of thumb that they simply respond to tone of voice or body language. I know that when I say "siéntade" to him, he sits, even though he didn't hear the Colombian Spanish command to sit until a couple of months ago. The cool part about all of this is that we are a nation of immigrants--a polyglot nation. My grandparents emigrated here from Romania (I speak not one word of Romanian), and most of my acquaintances (even those who trace their beginnings back to the Mayflower or before) have a similar story about where their parents or grandparents or they themselves emigrated from. Learning about all of these interesting people, even for Moki, involves learning about their origins, their languages, their desire to be here. And I find it very exciting. So, Moki, siéntade, or seedyet, or suware, or zit, or senta, or ulu. Or "sit" in any language whatsoever. In that respect, in our own individual ways, we are all alike. Being a newish NYC resident, I didn't realize that the Marathon passes about 100 feet away from the front door of my building. Of course, I went out early to chat with the throngs of people already gathering along the police guardrails set up on both sides of First Avenue. There was one band playing a block or so away, and several others were within earshot as well, which gave the scene a party atmosphere. The police presence was quite impressive, and I struck up a conversation with a few nice NYPD cops, all of whom agreed it was a "cool detail." The temperature was normal for November, in the low-to-mid 50s, and people were strolling or watching or listening to the bands, having a great time. One of the things that impressed me most was the number of dogs out with their owners. The last time I was so "up close and personal" to a Marathon was years ago in Boston (long before anyone had visions of pressure-cooker bombs in their consciousness), when I was with a group of friends who shoved our way to the front of the reviewing area right at the finish line. The legendary Bill Rodgers won it that year, which made it even more delicious to cheer for a native son. So many differences between then and now! I don't remember seeing many policemen on duty back then, and I don't remember seeing any dogs at all. Now I've said for a long time, New York is a much more prominent "doggie" city than Boston ever was when I lived there. Here, no matter what time of the day or night, dogs are out on the sidewalks with their owners or walkers. Marathon day was no exception. Many dogs were hanging at the guardrails with their owners. When the first wheel chair entrants zoomed by, the crowd noise and applause was almost deafening, and that didn't stop for the entire day, even after the elite runners had passed. People with signs from different clubs and different countries clapped equally for everyone as they passed. I clapped until my hands got sore and yelled until I was afraid I'd lose my voice. And noise notwithstanding, these city canines are quite impressive. I heard hardly a bark, nary a growl, and no fear-crying from the noise, although there was plenty of noise. All of this just reinforced my experience in New York so far. In this crazy, fast-paced, noisy, exciting city, the dog population is quite happy to co-exist with the human population. It's taken for granted. And dog-lover that I am, I love watching and enjoying and interacting with dogs of all breeds and shapes and sizes all the time in this amazing place. I never much believed in fate, but I'm wondering whether I should revisit that point of view. When I moved to New York City recently, I wondered how Moki would react. I figured he'd be fine--after all, he's 7-1/2 years old, and as long as I'm around he is happy. I was wrong. He had a hard time adjusting to our new environment, so I decided to hire a dog-walker. Belgians are naturally neurotic (forgive me for anthropomorphizing), and he had issues when I walked him: lunging at other dogs, lunging at random people, sometimes even lunging at baby carriages. He'd even lunged at my own daughter, which was shocking and upsetting. All of that was verboten on busy city sidewalks. I asked around the neighborhood, but no one could recommend a great dog-walker, so I did what I always do--went online and found multiple dog walking services. Then, "extremely scientifically," I chose the two with the "most adorable" websites and requested meetings with each of them. Only NY Tails responded. We met at my apartment the next day. Paulo, co-owner of the service and originally from Brazil, arrived at my door--tall, strong, smiling, knowledgable, confident--he and Moki got along great from the get-go. He took Moki for a walk to see for himself, and half an hour later he returned, reporting that Moki lunged at no one and was not reactive to dogs, people, bikes, or anything else. The problem, he asserted, appeared to be me. I didn't disagree. Moki has always been my over-the-top protector. I hired Paulo on the spot. For the next several days, Paulo walked Moki, and all was well. Then he told me that Moki's "permanent" dog-walker, Andres Fonseca, would be starting. I was a little disappointed, wondering whether Moki would be so well behaved with his new walker. Paulo told me not to worry. The following Monday, Andres buzzed into my building. I opened my door, and his 100-watt smile lit up the place. In the foyer sit my harp, my cello, a full-sized keyboard, a guitar, and a music stand, not to mention bunches of sheet music. After we exchanged pleasantries and Moki ran over to Andres, licking him and wagging his tail, Andres asked, "Are you a musician?" Despite all the obvious musical accoutrements, no one had ever asked that before. "Yes, I am," I said. "Me too," he responded. "Oh, what do you play?" I asked, excited that a fellow musician had entered my dog's life. "Drums and percussion," he said. Is it all fate? Or just coincidence? Will she publish a piece that gets someone's interest and increases Andres' opportunity in the city? I certainly hope so, because he's a cool person and a great musician. Moki and I have been a team since 2009, when he came to live with me as an 8-week-old puppy. 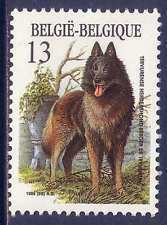 A Belgian Tervuren, he was actually the fourth Belgian shepherd I'd owned, but this time was different. My husband had died--much too young--two years earlier, and this was the first dog I would raise, train, and love all by myself without the support and help of another human. And Flash, the Belgian whom I still call my "heart dog," had died of cancer several months earlier, which was a terrible blow. I picked Moki up at the breeder's house in Northern Connecticut, my older female Sizzle along for the ride. On that ride home, Moki let both me and Sizzle know he hated being in a crate. Sizzle, who loved to be ensconced in her crate, spent the entire two and a half hour trip with her paws over her ears, as the tiny pup cried, screamed, barked, mewled--whatever he could do to let me know he was less than thrilled to be hemmed in. I stopped every half hour or so to walk him, but he refused to relieve himself, until we were about a half hour from home, when he pooped a pile the size of himself in the crate (common wisdom says a dog won't do that, soil the place where he is sitting, but my Moki had no problem with it). Sizzle buried her head under her crate pad as I removed the sticky pup from the mess, poured some cool water over him, and put him on paper towels in the back seat. Then I tried to clean out the crate with bottled water and whatever I could find. It never ceases to amaze me how such a small puppy can manufacture such a big a smell. Somehow we made it home, where I gave him a proper bath and Sizzle many dog treats for being so patient. Thus began an adventure that has now been running for more than seven and a half years. Moki continues to be as cute in his own way as he was when he was 8 weeks old. He's been a wonderful partner, companion, and helpmate to me, and I will use this blog to write about some of his delightful (and not so delightful) antics.